who knows where to get the best torsion adjustors ???? Going to replace the torsion bars too. Who know the best place to get them??? Dalton, I get all my torsion bars from Kartek in California. They are a race shop so they will have the quality stuff and not the chinese crap. They ship fast and actually have the best prices. If you're gonna do an adjuster get the king kong one from Sway-a-way. I also run Sway-a-way torsion bars. Had a quick look and I watched a video comparing led fog lights to halogen bulbs. It showed that the LEDs were brighter but didn't throw the light as far. I don't know exactly, probably it is just an old video, I think that reflectors are better nowadays. I have read also that in the Northern Ireland where I live that for high intensity lights you need to have washers. Does it true? Anyway, I am thinking of purchasing fogs by SiriusLED. Will these for fog lights work on a 2013 honda accord ex-l sedan without needing a resistor? Has anyone tried them? Wow! what a run! Only had three cars, me and two Baja's the whole way was easy and there were flowers and all kinds of stuff blooming. Saw a bunch of animals, just a smooth drive. Sorry if you missed this run it was just laid back and fun. Still stoked from it! We went from around 900 feet to over 7100' in elevation and put around 420 miles when it was all said and done. Oh Ya at the end we all stopped at the Dairy Queen in Cave creek and had a little something cool before finally going our separate ways. Thanks to everybody that could make it. Plus now you have bragging rights! Hopefully the other guystook some pictures and can post them up. I made the 400 miler this year after trying for three years . Very fun time for three of us any way. Dalton only made it a couple of miles then car problems took him home. Thanks to Tony for pulling his trailer and following him home. 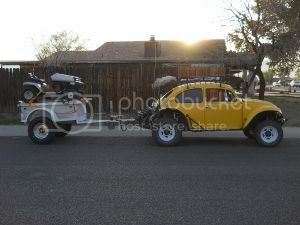 Two Baja's continued on and then were joined down trail by AZdesertrat87. We made it over the 4 peaks trail without trouble and into Pumpkin center we went for gas. Left Pumpkin center on 188 to Young where some Police were shooting RADAR at us but as we were all under the limit we were good. Camped at Haggler springs campground Saturday night and had a big campfire and good supper. Sunday we took off for camp Verde via Payson and up 87 to 260 west. As fossil creek road is closed we just went down 260 to salt mine road in camp Verde to the Copper Canyon power line road. I think the only time this road was smooth was when my car was completely off the ground but I made it to Cherry road. We then dropped down to I17 to the Bloody Basin road and ran east to fr24 into Seven springs then on to Cave creek and ice cream before heading our way home. If I can get my pictures off my new phone I will post. Want to send out a big Thanks to Troy and Dennise for all the help in getting my family home.. Thanks for being there for me. Don't know why I called Troy Tony,sorry about that. It is really great when we can count on people in the group and on the runs to help out each other and make sure we all have a safe and good time. I think the 400 miler put the final push for me to rebuild my motor. It ran really good on the run but I knew it was having oil burning problems for some time. Now it looks like I am fogging for bugs. Time to pull and rebuild. May add some more preload into the rear while I have the motor out also. its that time of year again!!! May 18 -20th .... yee Haw!